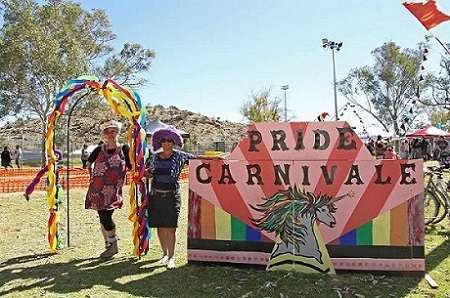 Performers and artists will converge on the Red Centre this week for the Alice Springs Pride Carnivale September 1st-3rd. The festival gets under way on Thursday, the first day of spring, with an art exhibition at Yubu Napa Gallery. “It will be great to see everyone’s creativity on display,” says gallery owner, Ric Farmer. Keynote speaker this year is Dr Stephen Kelly, lecturer in Sociology from CDU in Darwin. The alcohol-free family Fair Day on Saturday at Snow Kenna Park will include an outside broadcast (OB) by CAAMA Radio from 11am until 3pm. The day will include stage acts, stalls, food, entertainment and a camp dog show. Headlining acts this year will be Warren H Williams and Pixie Jenkins while other local talent will include Circosis, Desert Tramp, Justin Fenwick and Camille Bernardino. “I look forward to Fair Day and attend each year. I have a passion for fashion and love to dress up,” organising committee member Fanny Waterfalls said. “I especially love Fashions on the Field … it’s so fun to see my faerie friends and family in all their finery. The carnivale concludes on Saturday night with a queer short film festival followed by cabaret acts by local, Top End and interstate performers including Destiny Haz, Dreamtime Divas, and Gabby Dever at Watch This Space Gallery.